It is a little hard to trace the roots of macrame as an art. Rope and twine aren't made to withstand the test of time. Ancient civilizations realized the value of knots as a means of counting. Knots served as memory aids, and the Incas developed a kind of knot language. For example: different knots were used on different pouches to identify the items within. The word macrame is believed to be derived from an old Arabic word magramah. 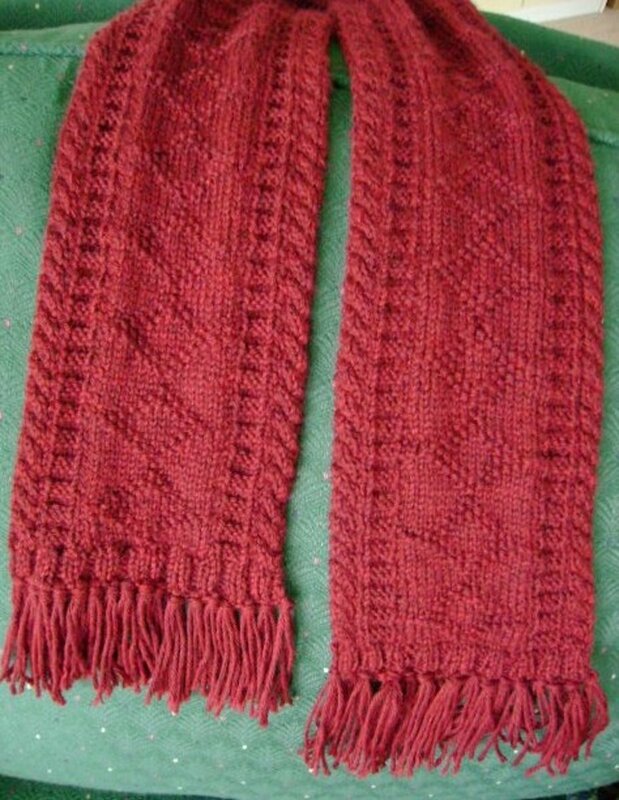 This referred to the ornamental fringe seen on the edges of scarves or shawls. Later, the ornamental fringe showed up in England in tablecloths and clothing. In the early 1800's, seamen, who spent many hours at sea, made macrame an art peculiarly their own. With rope being the most plentiful material on the ship, it's hardly surprising that many of these men perfected this craft. 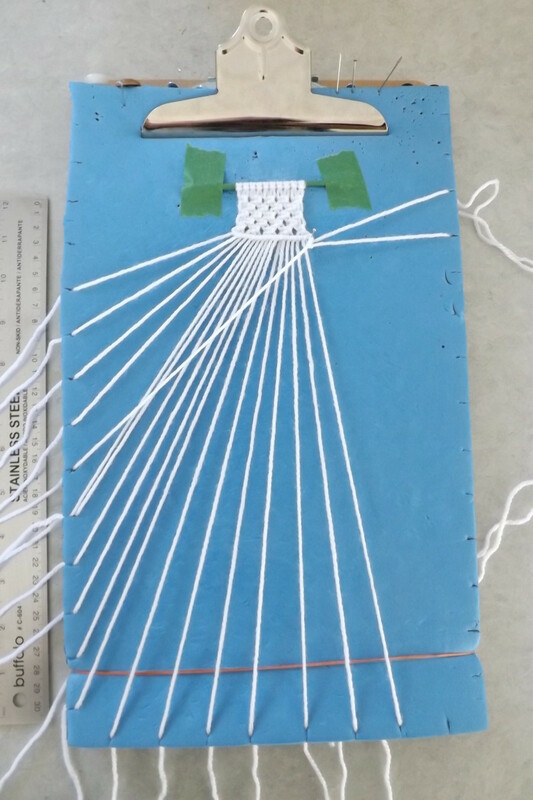 Sailors used macrame to help pass dull, off-duty hours. No doubt their knot tying earned them money in foreign ports too. In modern times, macrame means; The art of using various kinds of knots to produce decorative patterns in any form of braiding, chain or continuous fabric. The popularity of macrame today is becoming more pronounced. As in the 70's where you seen ponchos, plant hangers and those (sometimes) creepy owls, this craft is making a comeback. Plant hangers are updated, and just as beautiful to us, as they were to those who knotted before. Owls now adorn ears and knots are being used to make intricate micro macrame mixed with beads. 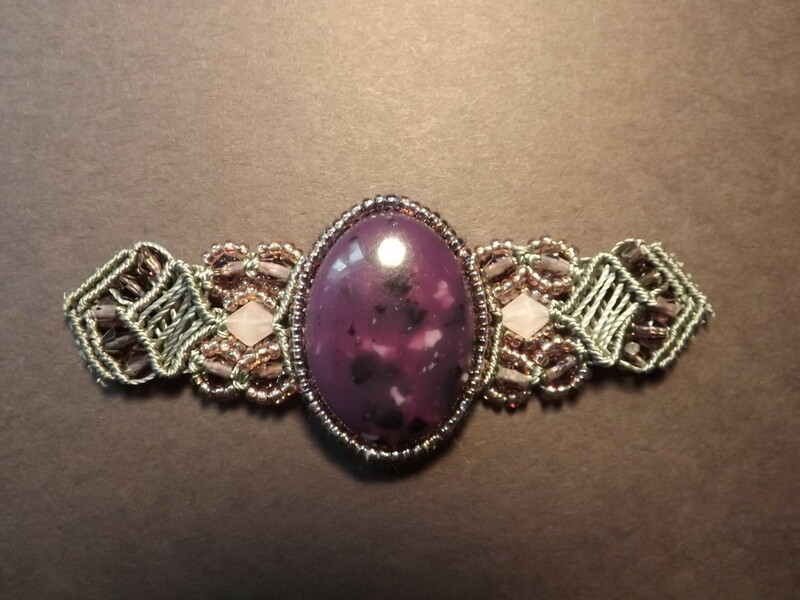 Macrame uses inexpensive materials, and gives you exciting results for relatively few hours effort. This awesome craft can be tackled by virtually anyone of any age. If you know a few basic knots and have a little imagination, you can make an innumerable amount of things that are as beautiful as they are individual. Macrame has been used in many era's.. Have you done Macrame earlier in your life? I learned Macrame in my school years. I learned Macrame in my adult years. I wish to learn Macrame sometime in the near future. TIP: Your working surface is very important. if you have to mess around with your working surface, you won't be able to focus on your knots. The first thing you will need, is a working surface. Something soft enough to take pins, but otherwise firm and portable. I had a sleeping pad left over from when the kids were little, so I cut it to size on my clipboard. I also found it useful to put cuts at ½ inch intervals, to hold my strands tight. Pick up a garden kneeling pad for under $10.00. Cut it to same size as the clip board, put your cuts all around the edge at 1" intervals and you are ready to go. If you are looking around the house, a piece from a cardboard box would be ideal. Styrofoam board, cork tile, balsa wood, or bulletin board material would work. So would wrapping a folded towel in a pillowcase. The working surface should be reasonably rigid, but soft enough to allow the easy insertion of pins. There are many types of pins. 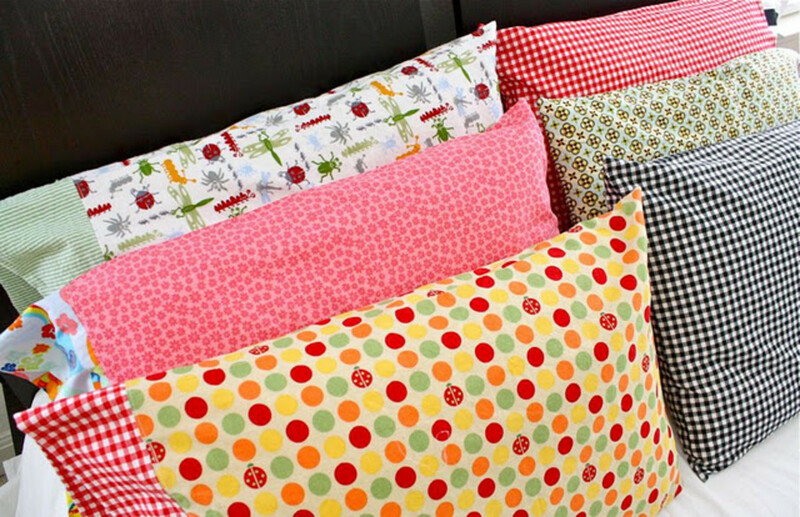 If you have some in your sewing basket, they should work just fine. Later, depending on what you are working on, (like a plant hanger), you might need the bigger T-shaped pins, just to hold larger cords tight. 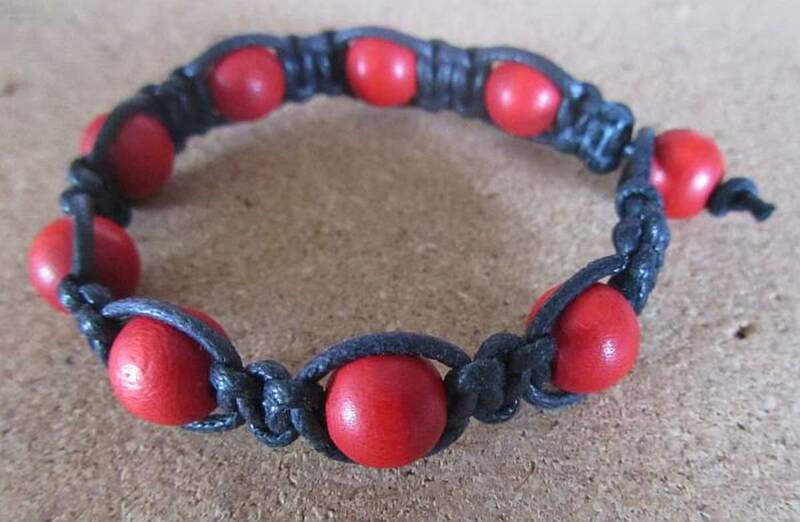 Thumb tacks work great if you are doing smaller things, like a micro macrame bracelet. Sometimes a knot gets messed up, so keep a blunt needle handy to help you gently fix it. Sharp scissors - Tape measure. If you are going to be making a larger project, rubber bands. The rubber bands are great for making the longer cords used in some projects, easier to handle. The last requirement you need is some form of cording material. There are many types of material you can use to macrame. 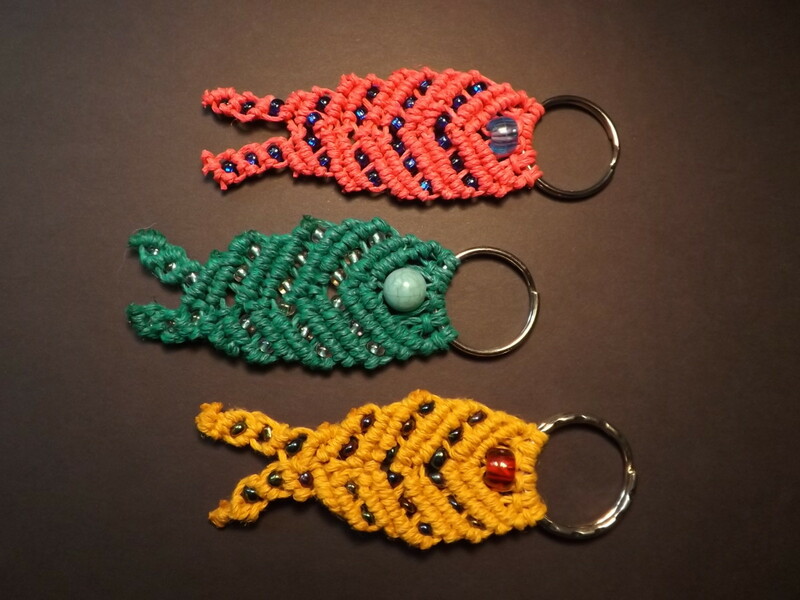 The fish are made with hemp twine, and following pictures use some yarn and ordinary twine from my kitchen. I will cover more materials later on, for now lets start knotting. The first knot is called the Lark’s Head Knot. This knot is commonly used to secure your work. You can use any number of things to secure your work. Above, I used key rings to secure the fish. The key rings are one example of a ‘holding cord’. When tying knots for a project, cords that hold the knots are also referred to as ‘holding cords’. 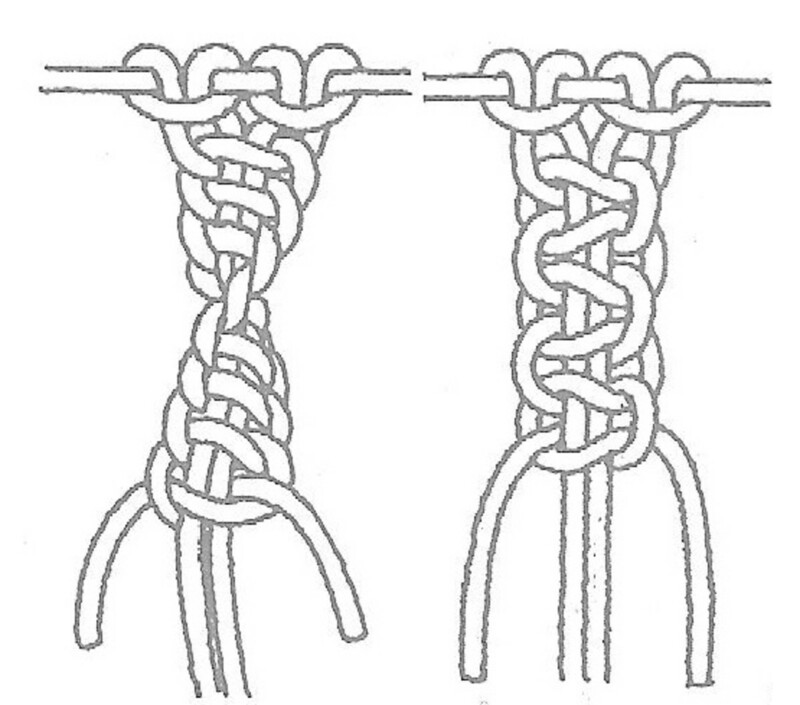 The strands that tie the actual knot are called ‘knotting cords’..
Cut two stands, about the length of your arm. This is a Front Lark’s Head Knot. 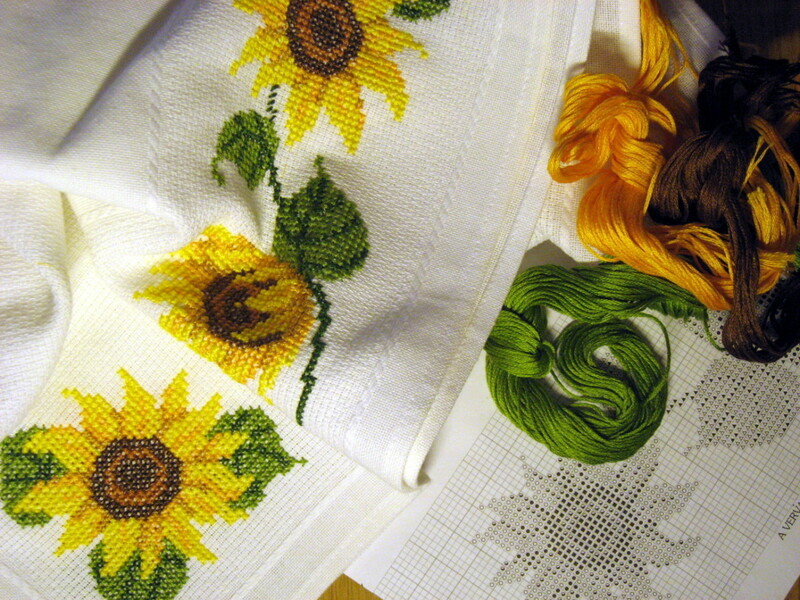 This will give you 4 loose working ends, with the knots showing in front of your work. When you are doing a project, you might want just the strings to show. 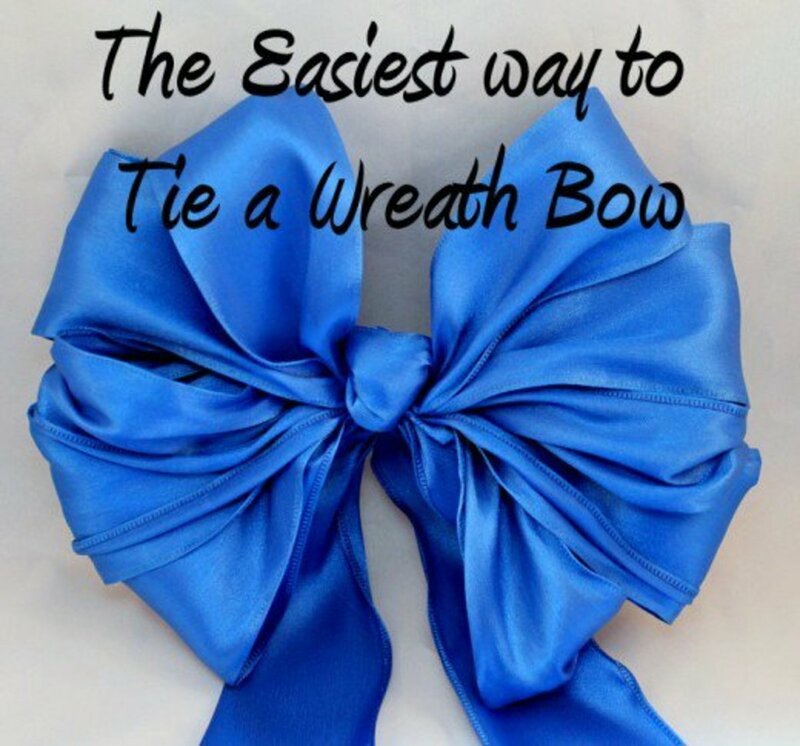 To do this, you make what is called a Reverse Lark’s head Knot. Your knot is now concealed behind the working ends. 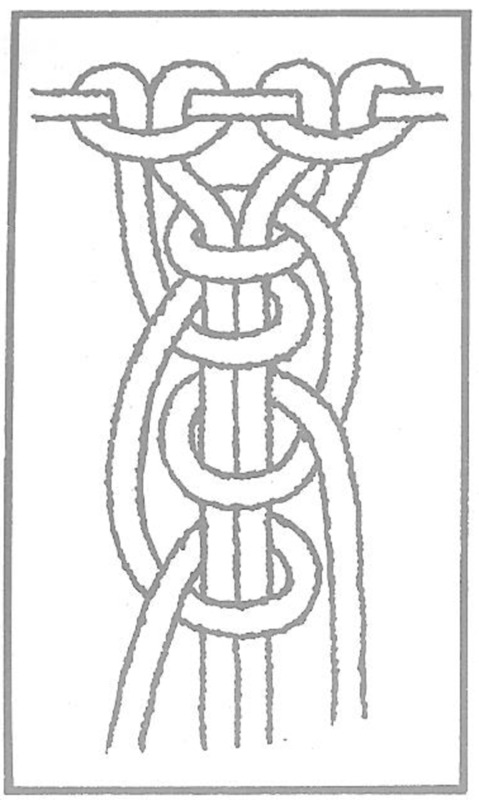 Either knot can be used to anchor a series of working strands to the holding ‘cord’. Lets try some square knots. The Square Knot is also known as the sailor's knot, macrame knot and reef knot. It may look complicated, but it is quite simple because you only have to work the two outside strands. If you started with the Lark's Head Knot, you should have two pieces of string, folded in half and attached to your holding cord. Secure your holding cord, with the four working strands, to your working surface. Secure your two middle holding cords to keep them straight. Bring Stand 4 under Strands 2 & 3, up through Strand 1, and out to the side. Even out the side loops, hold Strands 2 & 3 tight, as you slide the knot up them. Notice how this knot looks very similar to the same one that you use to tie your shoe. To complete the square knot, repeat the process starting from the opposite side. Bring Stand 4 under Strands 2 & 3, up through Strand 4, and out to the side. Even out the side loops, hold Strands 2 & 3 tight, as you slide the knot up. 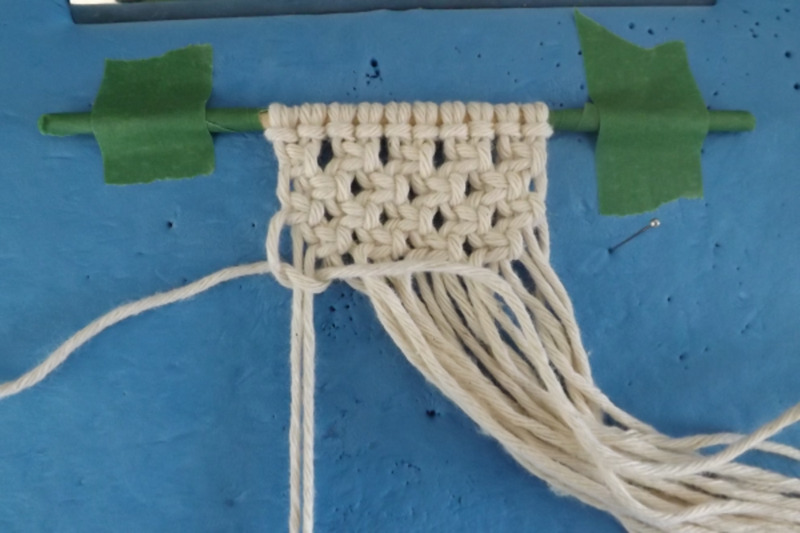 Continue making your square knots to desired length, making what is called a sinnet. 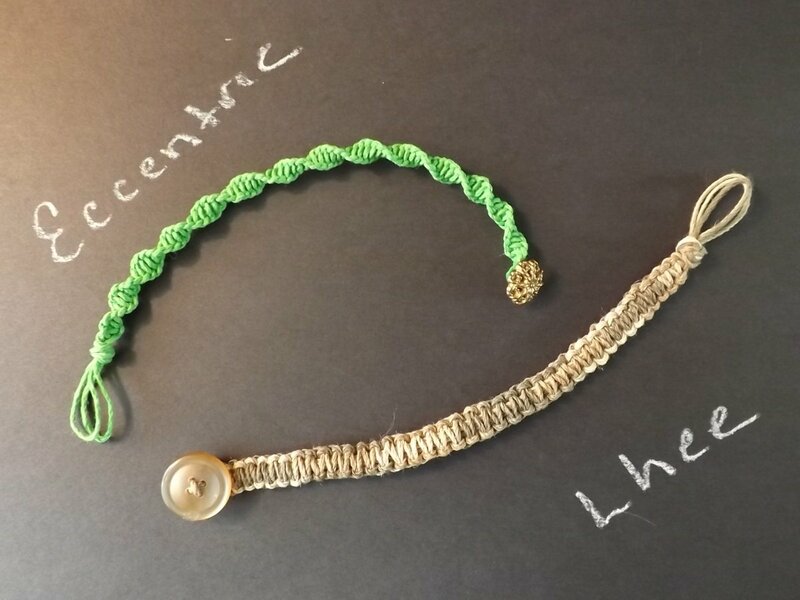 Trick: If you want your bracelet thicker, double the number of working ends. For example: Use 3 strands attached to the holding cord with the Lark’s Head Knot. This will give you 6 working strands, which are knotted in pairs. Very attractive braids can be produced using the Square Knot and the Half Square Knot. By repeating the Square Knot, it will produce a flat sinnet. 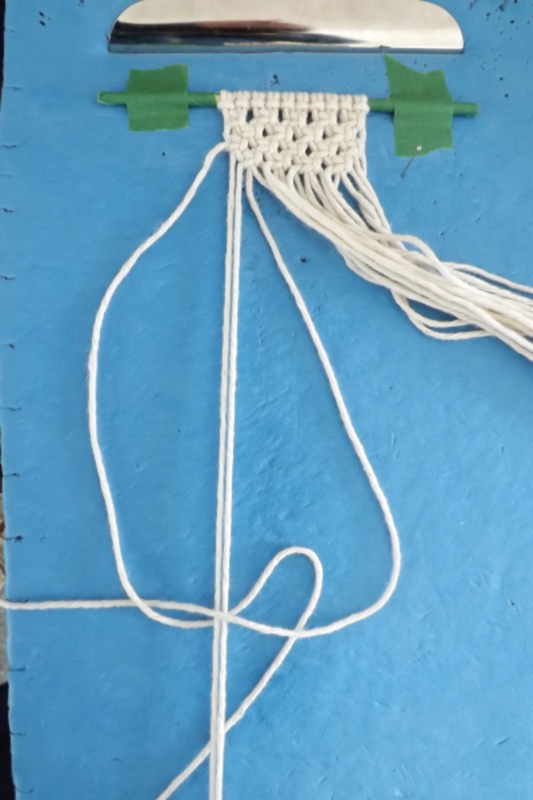 By repeating the Half Square Knot, it will produce a spiral twist sinnet. The Half Square Knot is exactly what the name says. Make a Square Knot; omitting the second step. It doesn't matter which side you start on, just make sure that you make the same knot on the same side. Keep repeating to desired length. Alternating square knots have a wide variety of uses. They can create a tight box weave or a lacy open weave. The first picture uses 8 strands, which makes 16 working strands. I used 10 strands of kitchen string in the second picture, cut about the length of my arm. Attach all 8 strands to your holding cord with Lark’s Head Knots. This will give you 16 working ends. You can use any number of strands, but your working ends must be divisible by 4. Divide the strands up into sets of 4 and make a square knot on each set. Drop 2 strands on each end, divide the rest into sets of 4, and make a square knot on each set. * Repeat step one, using all 20 working ends. Repeat step two, using 16 working ends. Continue from * to desired length. The simplest basic working knot is the half hitch. This knot can be tied either from the right or from the left, using one of the two pieces of string already anchored to the holding line. Chains and braids can be made by the simple process of repeating over and over again any of the knots you have already learned. 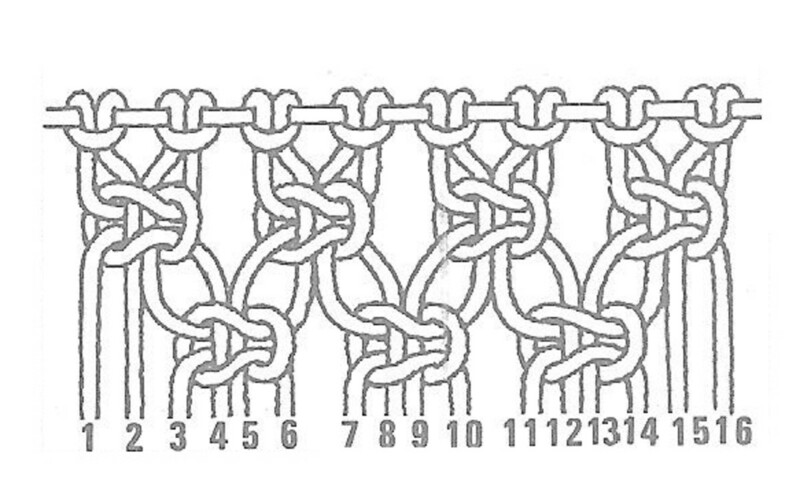 By repeating a right hand half hitch continuously you can produce a chain like that shown in Figure 5. Repeating a left hand half hitch will produce a similar chain. If you work a chain continuously with the same type of half hitch it will naturally tend to twist, but if you want a flat chain, just ease the knots around so that the chain lies flat. 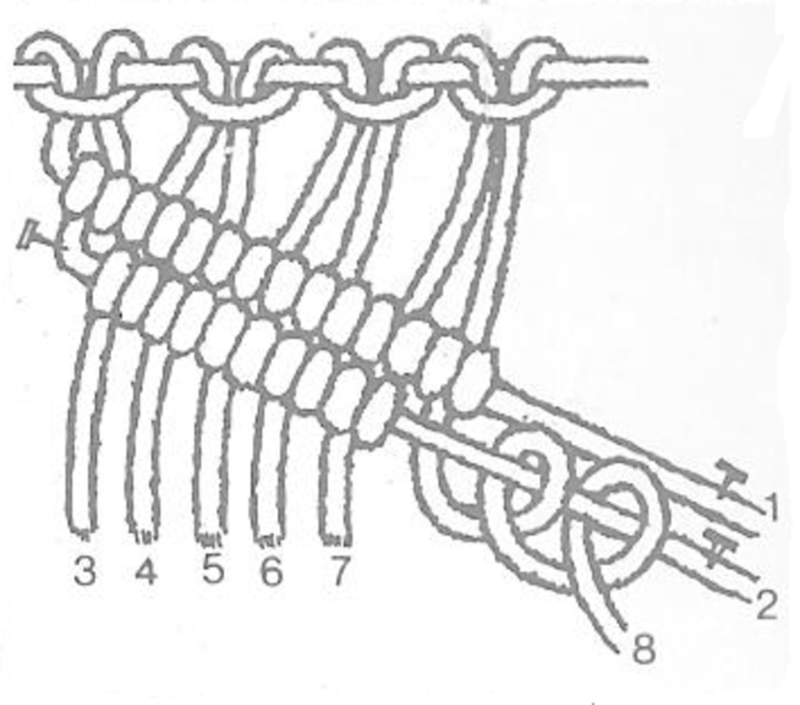 The alternating half hitch chain as its name suggests, is formed by alternating a right hand and a left hand half hitch. This is shown in Figure 6. To make any of these half hitch chains thicker, simply set on two pairs of cords with lark's head knots, and use the strands (four working ends altogether) in pairs. 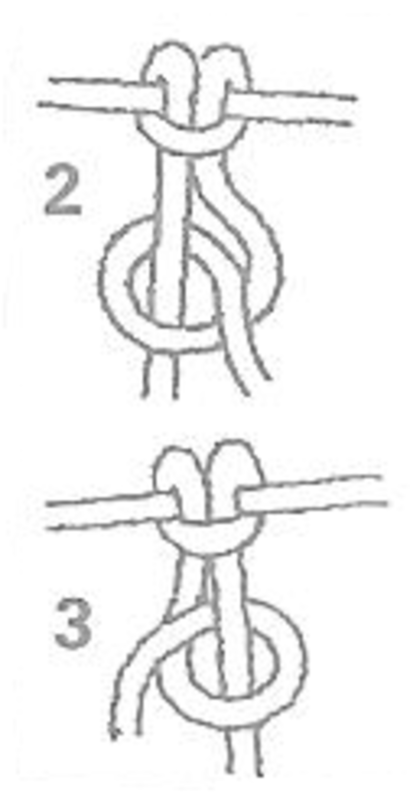 Another way of working a chain with four working ends, using the half hitch knot, is to anchor the two inside lines to your board with pins, and using the two outside lines, knot a half hitch with either outside strand alternatively over the two inner lines, which then become the core or knot bearer of the chain. 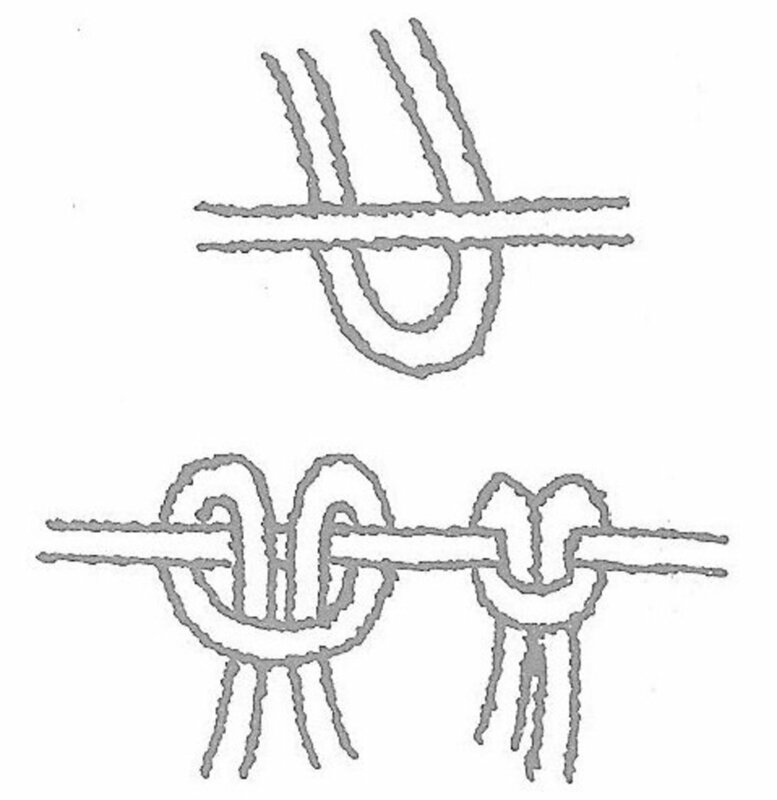 With the right-hand strand knot a right hand half hitch and with the left-hand strand knot a left hand half hitch (Figure 7). The simple half hitch knot may be used to produce 'cording' which can be worked in all sorts of ways - horizontally, diagonally, vertically, in curves and in circles, to produce numerous interesting patterns across any width you like. For example, if you use them on a belt width, these patterns look very attractive. Essentially the pattern achieved depends on how the knot bearing cord lies in relation to the other working strands. To practice cording, set on four pieces of string to your holding line, giving you eight working strands. These have been numbered from 1 to 8 from left to right in Figure 10. Pin down strand 1 across the other seven strands so that it lies parallel to the holding cord and a little below it. With strand 2, secure a half hitch round 1 (take 2 up over 1, down behind it and out through the loop). 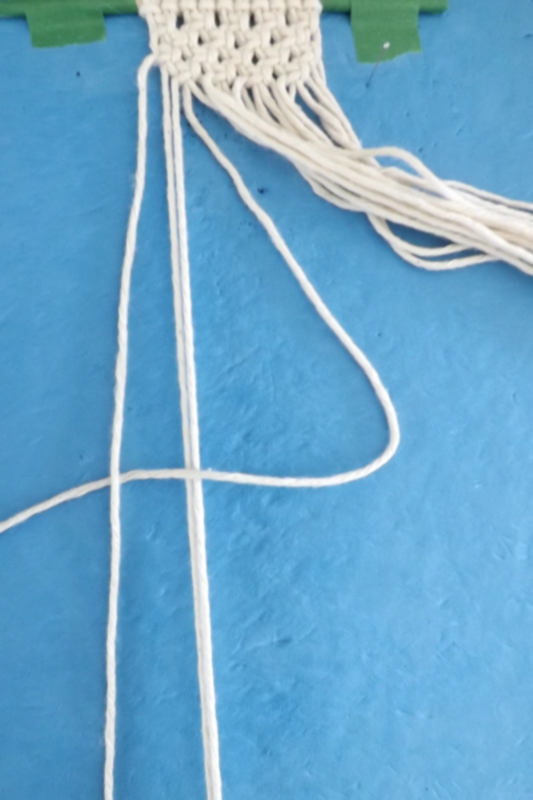 Repeat this knot so that you have made a double half hitch with strand 2 round strand 1. 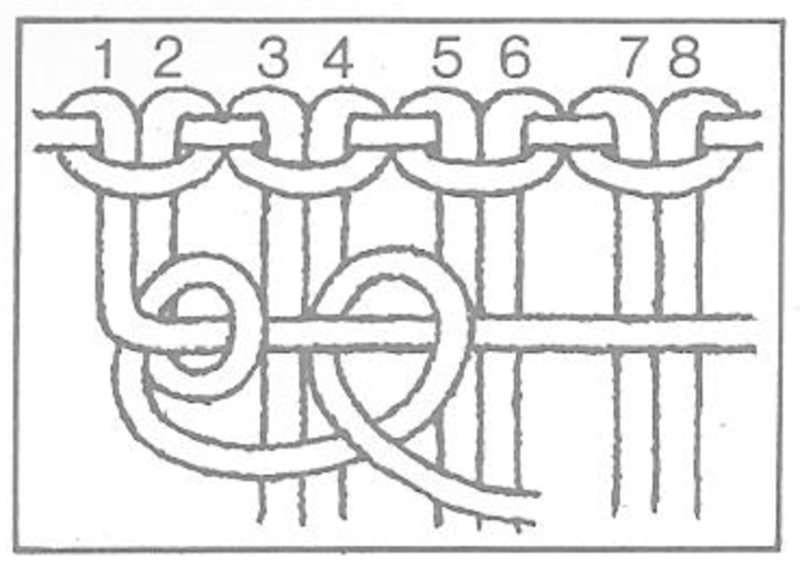 Take strands 3, 4, 5, 6, 7 and 8 respectively and with each of them make a double half hitch around strand 1. When you have made the last half hitch with strand 8 your work should look similar to Figure 11. Now pin stand 1 back across the other strands parallel with the first row and make your double half hitches around it, starting with strand 8. Using strand 1 as the cord bearer you can repeat this pattern as many times as you wish, though to make it any length, strand 1 much be must longer than the others. To work a diagonal pattern, pin the knot bearing cord diagonally across your working strands and make a double half hitch around it in the same way as you did before. To make a second row, however, the next strand in order (strand 2) should be pinned across to become the knot bearer. 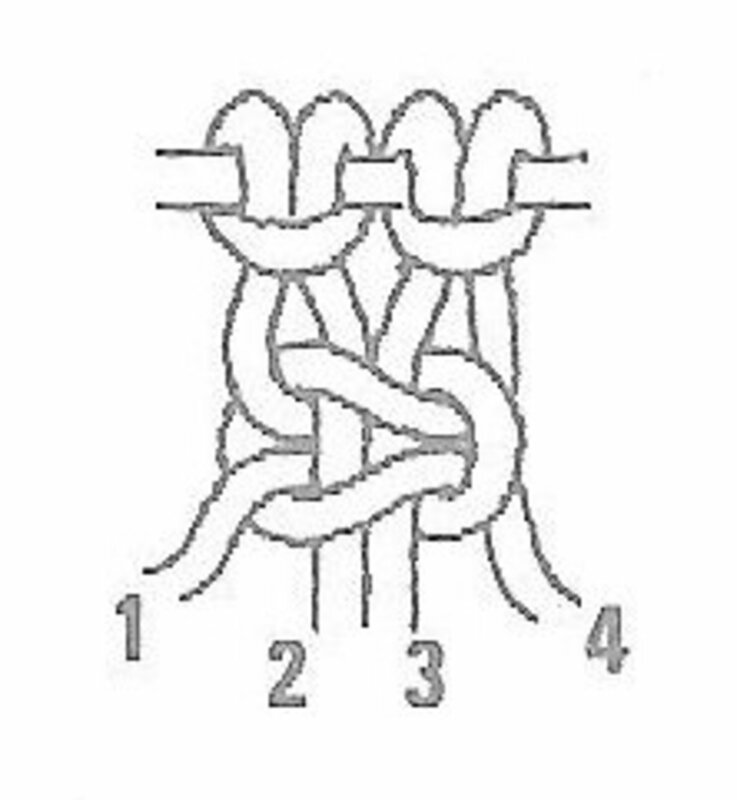 The first knot on 2 should then be made with 3 and the last with 1 (Figure 12). With a little practice you can work diamonds and X patterns simply by changing the angle of the diagonal knot-bearing cord. To produce a pattern of curves, pin the knot-bearing line in a curve across the other strands and as you are knotting on to this take care not to pull the curve out of shape. 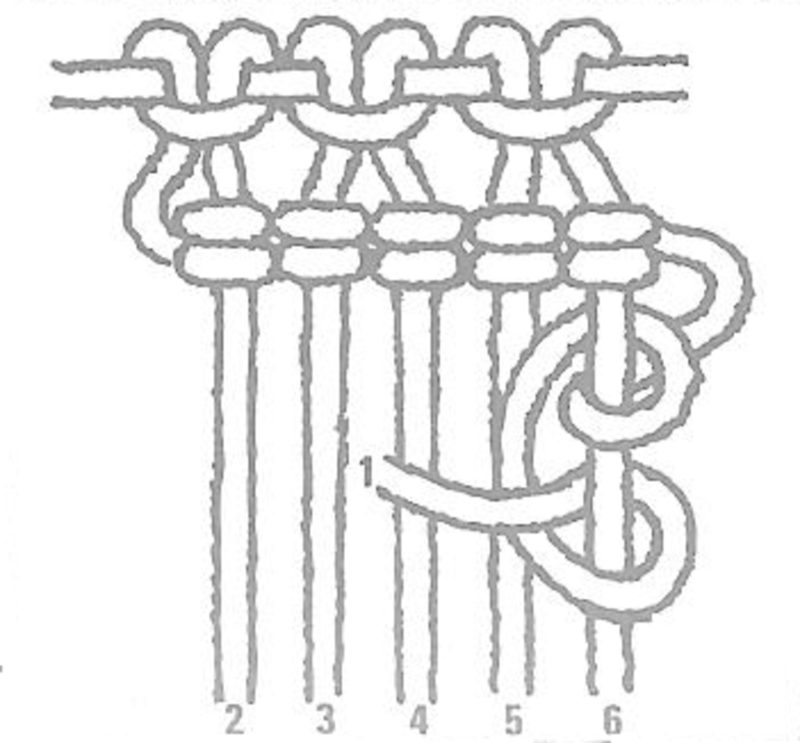 Another cording pattern using the half hitch is the vertical half hitch cording in which only one strand is used for the knot and is knotted back and forth across the other strands to produce the effects indicated in Figure 13. 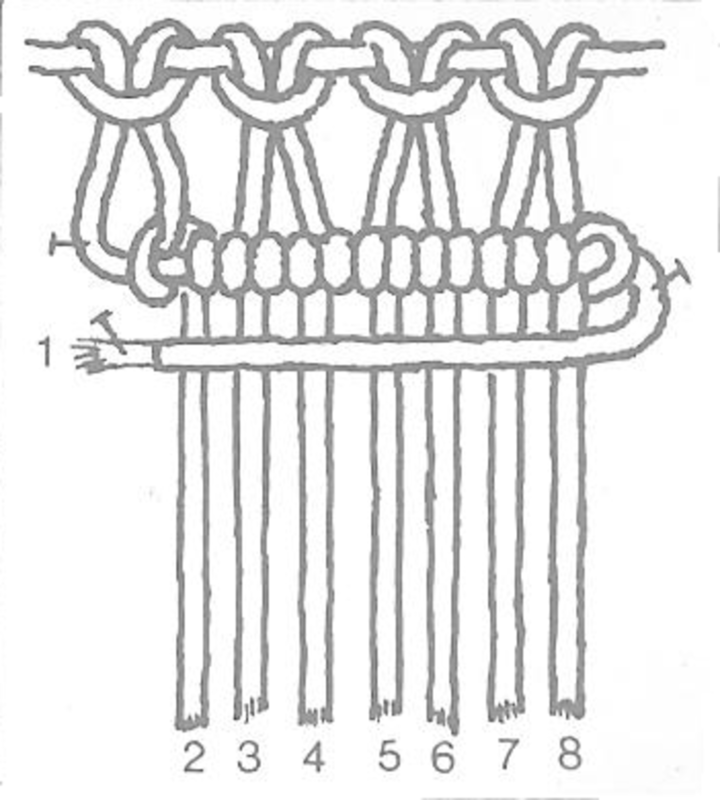 To do this, set on three pieces of string (six working ends) and make strand 1 eight times as long as the others. 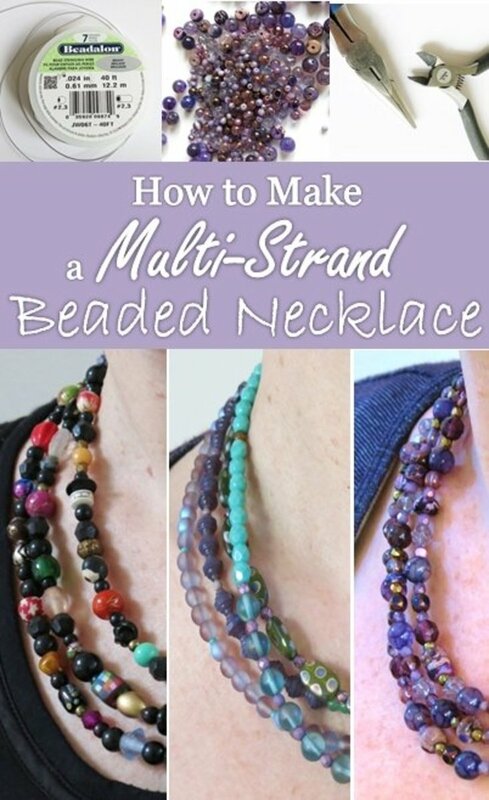 Hold the other strands down taut with pins and with strand 1 make a double half hitch on strands 2, 3, 4, 5 and 6. 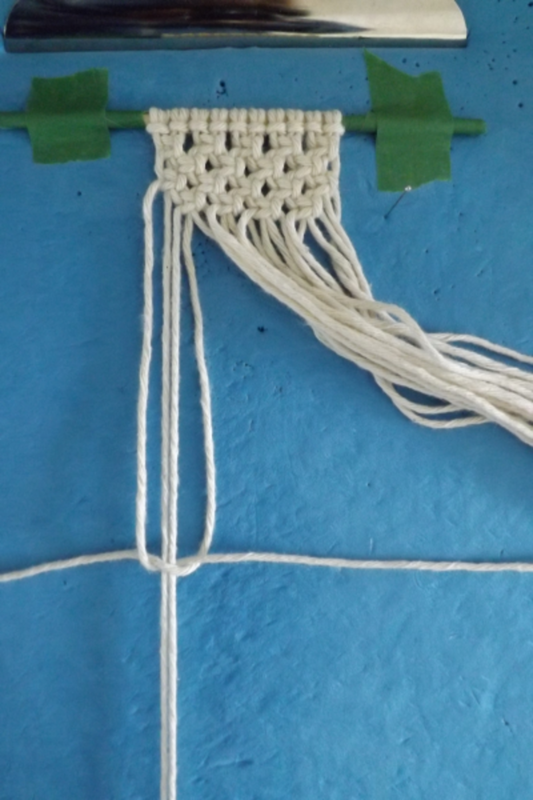 For a second row make another half hitch with strand 1 on strand 6 and work back across the strands in order. Getting started in the knot tying can be a trying experience, especially trying to remember all of the numbers and strands and what goes where. A lot of the knots and methods discussed in this hub will work with smaller material for making your own hemp jewelry or just a braided friendship bracelet. 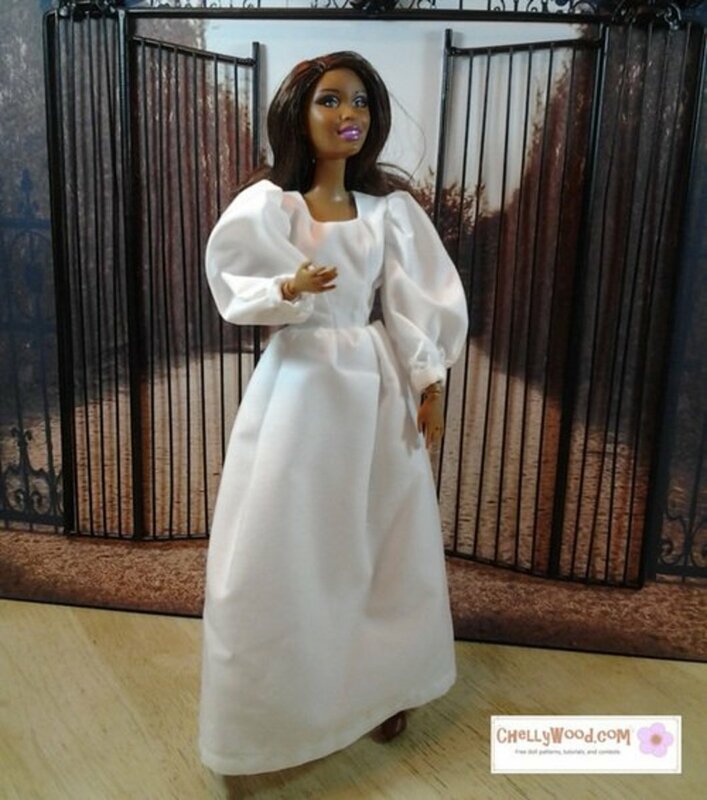 With a little practice you will become adept before you know it and have beautiful work that you can wear, display or even sell to make a little extra cash. When choosing your twine, make sure that the twine you choose is strong enough, and the right diameter for the article you wish to do. Smooth twines are the easiest to work with and give the best results. Household string, jute garden twine, sash cord, piping cord, and dishcloth cotton are all ideal. I used the hemp cord for the fish. The heavy yarn used for rug making (not knitting wool), is also fairly easy to work with, and gives effective results. Plastic twine and plastic-covered string which comes in bright colors also give pleasing results but are more difficult to work with as the knots can slip, giving the work and untidy appearance. 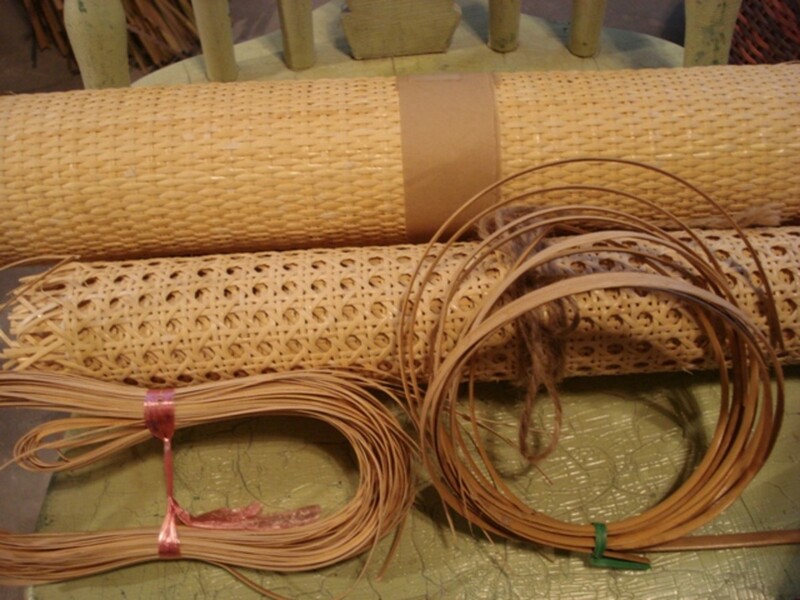 The amount of twine needed depends on the length and width of your article, the thickness of the twine and how complicated the pattern will be. As a very rough guide, make sure you have about eight times the length in string per strand of the finished article. So, if you are making a belt with four pieces of string anchored (eight working ends) you should cut four pieces of string eight times the length of the belt. Thank you everyone! Myra, I have found hemp supplies and materials on Amazon, but there are lots of places you can look, even our hardware store in the small town I live in carries some, it's not a common craft, so it might take some searching. You have refreshed my memories, which had forgotten. The best instructions for me to get going again in retirement. Where would be the place to order hemp and necessary suppliess? This is wonderful! My husband bought me a cute white dress recently and it has such a 60's feel to it, I wanted to make a belt to match. This will help me get it made! Thank you so very much! I did macrame as a teen in the 70s and then much later as an adult but not for a while. I have made many belts but none with holes for the prong. I intend to now. Probably also make a tie belt and then some jewellery ... the sky's the limit! Thanks for the incentive and all all your ideas. I love macramè! Thanks for tutorial share! You have some nice designs here. Shared on Facebook. What a wonderful description you have here. I appreciate all the work you put into making this Hub. This does bring back memories of my past when I used to do a lot of macrame. I would have kept it up too if they hadn't stopped selling the supplies. I am so glad it is making a comeback. This is so creative! I've heard of macrame before but never really knew what it was. What a well-done and beautiful article! This used to be so popular in the 70s and then kind of disappeared. But I do like the earthy look of these projects. Thanks for reminding us about this cool craft! This did bring back some wonderful memories from the seventies when it seemed as if everyone was either doing macramé or selling macramé products. I loved your explanations, illustrations, and detailed instructions. Makes me want to start working on a plant hanger. Thank you. This well illustrated article made my fingers itch to buy flashcards, hemp, and metal beads!!!! Looking forward to learning this new skill.